Dive Journal: This morning we’re back at Kelly’s Follies. I really like this site, and afterall, there are only so many dive sites off the island. Some repetition is natural and just fine with us. John is resting again at the apartment shaking off a bit of the stomach cramps. My initial descent takes me straight to a pretty french angelfish for a quick video session. 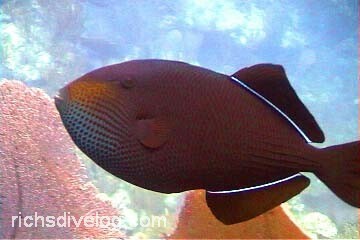 Then, as we descend over the wall, another gorgeous queen angelfish swims around us at about 70’. I am totally stunned at the look of these beauties in person and am quite dissappointed with the photographs later. Something again to do with the saturation of the blues I think. Localized light would probably work much better. There are once again schools of mahogany snappers and some nice sailors choice, which of course I can’t resist with camera in hand. I also spy a solitary spanish grunt underneath a ledge,a new one for me. Emptying my tank circling around under the boat, I come across a trumpetfish who poses for me for an extra closeup. We’re loving the diving routine from Salt Cay. It feels like we are on vacation.